Over time that general WNTW formula has developed into a few specific formula patterns in my wardrobe. And since I use this method so regularly – I thought it would make a good set of infographics to share here on the blog. I’ve been going back through my blog archives to grab some outfit examples of each of those specific formulas I use to share with you. 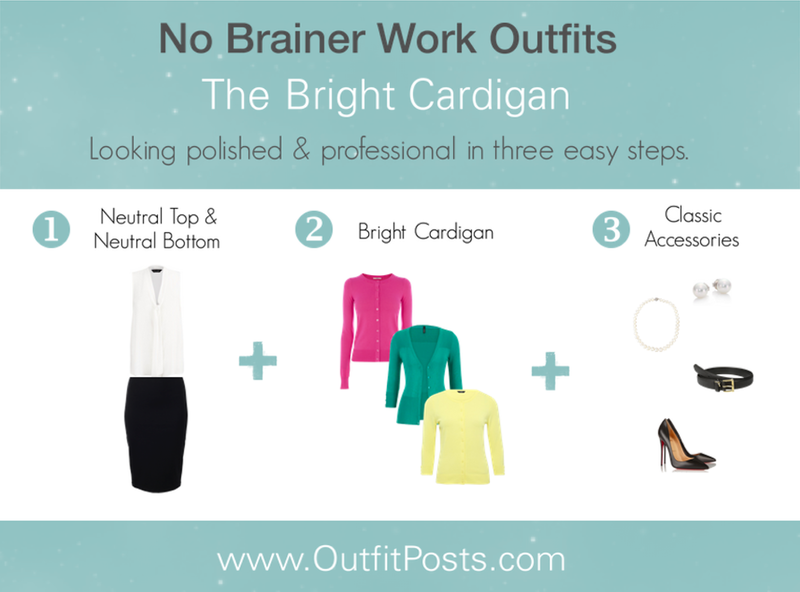 The formula I’m sharing today I call, “The Bright Cardigan” formula. This outfit starts with basic wardrobe staples. 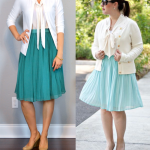 First, for the bottom, choose a neutral skirt or a favorite neutral pair of work pants. My basic bottoms tend to be black, grey, brown or navy. And then add a neutral top. I like black and white tops as super easy, can’t go wrong choices. They can be basic camisole/tanks or bonus points for texture with a tie-neck or ruffle on the shirt. Next pick a bright cardigan (or jacket) in a color that you love. It can be any color you want because the rest of your outfit is neutral. I try to pick what I think is a fun color because the cardigan is pretty much the only interesting thing about this outfit. When I get dressed using this formula I’m not trying to be a fashion standout – it’s just more about looking presentable for work in a hurry. So there is no need to figure out an amazing statement necklace or perfectly coordinating scarf. The cardigan is the pop in the outfit and everything else is background. 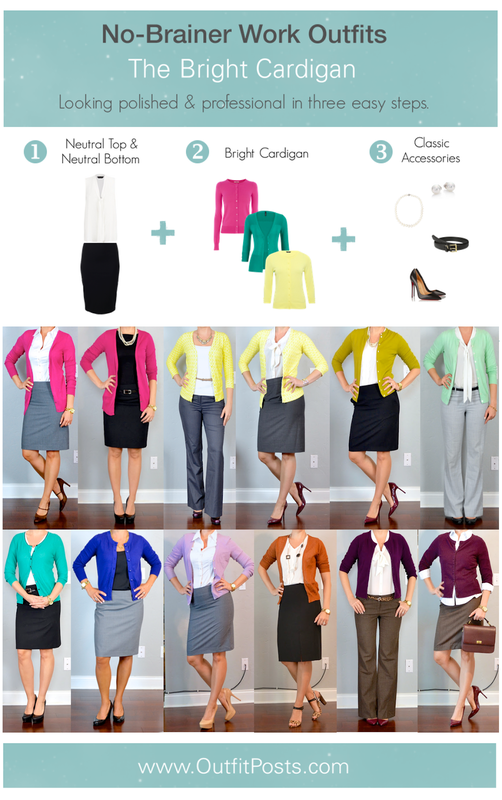 I feel like this outfit formula can easily be used over and over again for pulled together professional looks for work. Just sticking with the same blueprint and switching out the individual pieces – the outfits possibilities are endless! Previous Post: « outfit archive update – last six months! Love this idea for a post and for life application. It's definitely good to have a standard. I will often throw on an all-neutral outfit and pull out some fun shoes I dont wear often or something like that. Some days you dont want to (or dont have energy to) be a fashion star! Totally love this! I also miss WNTW. This is pretty much my go-to work staple. Especially when Loft has cardigans for $15 in a wide variety of colours, you can't go wrong! I like this post, but was curious about your opinion on where to find decent cardigans these days. I find that after 2-3 washes, most start to look ratty (curling up on the edges, for example), faded or pilled. I guess I could start doing everything dry-clean to try and lengthen their lives, but is there a good standby? So far, I have tried sweaters from Lands End, Target and Loft that wouldn't make it for the long haul. Love this. I plan on this formula as my go-to when I return back to work from maternity leave next week. I just need some more cardigans. Thanks for showing some examples! I'm curious about your other formulas. This is the best clothing post I've seen yet! I too would love to see more of your formulas with examples! Your blog always reminds me I don't own enough cardis LOL! I love the fun shoe idea!